At North Broward Chiropractic, we pride ourselves on keeping up with the latest advancements in technology and making it available to our patients. One tool we have had great success with is the Sigma Ultralign. The Ultralign is a computer assisted adjusting tool, used to analyze and treat the body. Sigma Instruments created the Ultralign by using technology developed by NASA for space, blending computer and engineering technologies. A gentle signal is sent thru the Sigma Instrument into the vertebrae. That signal is reflected back and interpreted by sophisticated computer software which provides a detailed spinal analysis. Dr. Shai or Dr. Allie will teach you how to read the Ultralign’s diagnostic pre-scan. This will show you which segments of the spine are out of alignment decreasing your health. Next, the gentle adjustment using the technology shows live time feedback that the adjustment is restoring motion to the spine. Treatment with the Sigma Instrument is highly efficient; the computer automatically ends treatment the moment your tissues have responded. Your post scan results will be displayed illustrating the health of the spine and nervous system has been restored. This may be the most important spinal diagnostic discovery since the invention of the MRI. 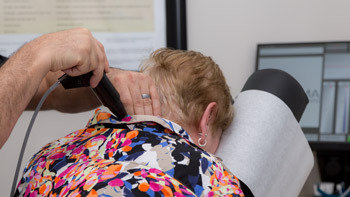 For patients that are apprehensive about getting an adjustment, the Ultralign may be a more comfortable option as there is no application of manual rotation or thrusting forces. The Ultralign allows our Chiropractors to perform an adjustment in a seated position that feels like gentle tapping or light pressure. There is no bending, twisting, or popping sounds. All ages love this highly accurate type of adjustment. Sigma Ultralign is covered by most insurances and Medicare. Our office is always able to check your benefits.